Delaware law requires vehicles to be titled and registered before being allowed to operate on Delaware highways. New residents must title and register their vehicles within 60 days after becoming a Delaware resident. State law requires vehicle owners to complete an application for a Delaware title and registration to operate a motor vehicle on public roadways. Before applying for a vehicle title/registration, the vehicle first needs to pass a safety and emissions inspection at any of the DMV locations. It is mandatory to apply for a license plate within 30 days of buying a vehicle. You’ll be issued Delaware license plates when you register your vehicle. The license plates must be attached to the back of the vehicle and must bear the sticker showing year and month of expiration on the lower right corner of the plate. You must register your vehicle to apply for a license plate and renew your registration to renew your license plate validation sticker. You can replace a lost, stolen, or damaged license plate or validation sticker in person at a Delaware DMV office. There are a number of special license plates that can be purchased online or at any DMV location. A number of plates have eligibility restrictions that must be complied with before the plate can be ordered. The following plates are available for all vehicle owners that meet the eligibility requirements. Vanity plates are also available for vehicle owners wishing to display these tags on their vehicles. The plates may be ordered at any Division facility. Use the Vanity Plate Search to check the availability of a plate online. You can transfer a license plate to another vehicle. Just bring the titles and proof of Delaware insurance for all vehicles involved to the Delaware DMV Office. Notate the odometer disclosure of each vehicle in section 1 in the Odometer Disclosure box as well as sign and print your name as buyer. You will be subject to any title fees, service fees, and/or registration fees based on the nature of the complete transaction. Delaware law requires vehicles to be titled and registered before being allowed to operate on Delaware highways. You must title and register your vehicle in person at your local DMV office. 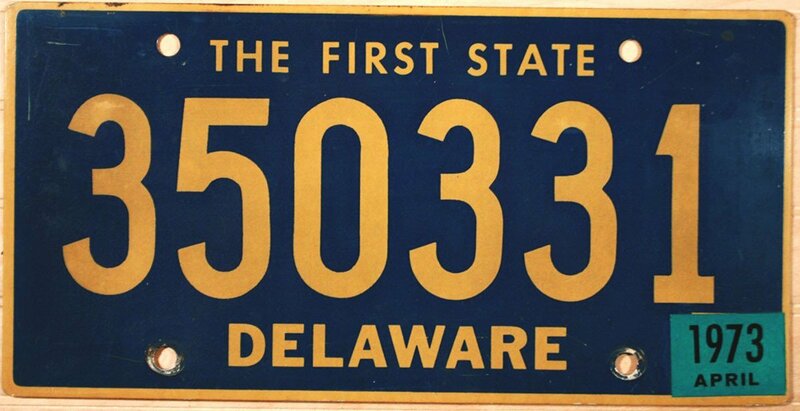 Delaware residents have 30 days from the purchase date to title and register their vehicles. New residents must title and register their vehicles within 60 days after moving to the state. The vehicle can be registered for one or two years. If you purchase from a dealership, they will handle all the necessary paperwork for registration, but when buying a car from a private seller you’ll need to title and register it yourself. Buying a used car in Delaware? Don’t make a costly mistake. Run a Free License Plate Lookup for your Delaware-registered vehicle! Run a Free Delaware License Plate Lookup to uncover the full-story of your Delaware-registered vehicle.